Welcome to Port-au-Prince, Haiti the sign says, I agree, I was glad to leave Petit Goave, a very boring city. 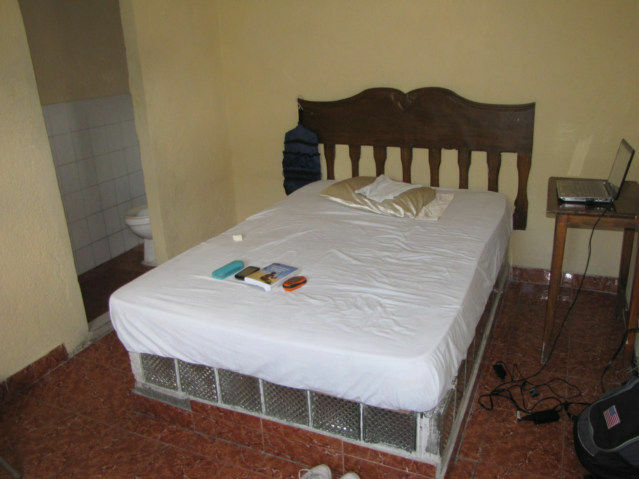 It would be hard to say Port-au-Prince is boring. This photo was possible because I can pull a camera, and shoot, in seconds. I was riding by in a bus moving rather fast, I noticed the sign wrapped in chaos, and took the photo. It took about 3 hours to go 40 miles. 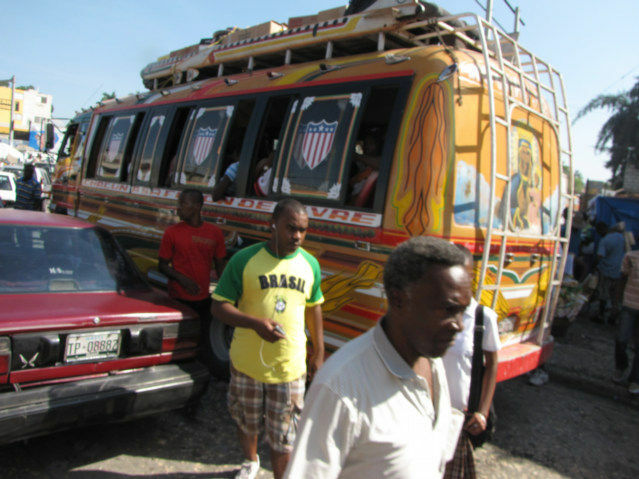 The old American School Bus was slow to leave Petit Goave, then a problem with the tire. I changed buses in Leogane and again it took a long time to leave. Once I arrived in the city, I needed to stand on the corner looking around all friendly like until someone helped me. “Champs de Mars,” a reference point given by the Lonely Planet, nobody recognized the park. This is not a war zone, rather a tame city which has trouble putting up street signs. I have been avoiding this type of vehicle, looked cramped to me, no such luck in Port-au-Prince. The good people of Haiti put me on one of these; I believe a different version of a Tap Tap. I made a video of the trip, I watch it, the music was so loud in the Tap Tap it somehow wiped out all the street noise. On arrival to Rue Pavee, I went directly to a Travel Agent, and asked about a Planet Ticket, I bounced off the first agent. The prices of ticket were double the Internet prices. 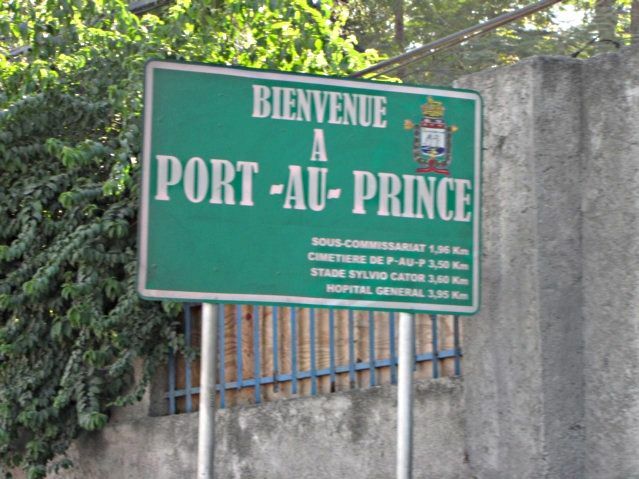 I took a pause, decided to purchase a plane ticket at the proper price, would take a couple of days living in Port-au-Prince. I need to wear-the-travel-agent-down. More or less, sit politely in the office a few times until she tells me the truth. We agreed, I am now in a room for 600 Gourde, he was not correct on the price. However, what a great location, two blocks from the Travel Agencies, and three blocks away from the actual Palace. I think I am dead center in the middle of the action of Port-au-Prince, Haiti. 600 Gourde is about 15 Dollars, I would say, 600-750 Gourde are easy prices to find in Haiti, I have gotten 500 twice, but with more arm-twisting than most traveler are up to. His name is Mathew, and mine is Andrew, there is rhyme to the reason. 1. We always make it to our destination, few people fail, because let’s face it, we really do not have much choice, once we leave, we have to go somewhere. 2. The path always shows itself, if you do not try to control the situation. All we need to do is listen to the answers; to questions we did not ask.